Last week, President Obama and China’s President Xi announced a new plan to begin tackling greenhouse gas emissions—their first joint statement about global climate action. The agreement, which comes on the heels of a historic climate march in NYC, sets the stage for what we hope will be successful international climate negotiations at the 21st Conference of the Parties (or COP21) in Paris next year. 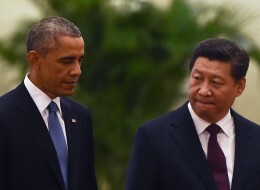 Presidents Obama and Xi announced a major joint climate agreement last week. GREG BAKER/AFP/Getty Images, via Huffington Post. The historic nature of this agreement can’t be overemphasized. Fred Krupp, CFE’s founder and current president of Environmental Defense Fund, recently wrote in the Wall Street Journal, “[the agreement] is a game changer because it can begin to transform the way the world thinks about climate action. Instead of nations using each other as excuses for inaction, they will challenge each other to do better. […] the announcement is a diplomatic breakthrough. Having the world’s two biggest emitters making joint commitments to reduce carbon pollution is a huge shot in the arm for global climate cooperation.” With over one third of global greenhouse gas emissions covered under this agreement alone, the world stands poised to make even more history in Paris next winter. While the plan is a great start, it could have gone further. China has committed to reaching peak greenhouse gas emissions by 2030. Even though they complete a new coal plant every two weeks, the Chinese already intend to increase generation from renewable sources to at least 20% of their energy mix, which includes hydroelectric and nuclear. Our two countries will also work together to meet our goals. We’re expanding joint clean energy research and development, launching a climate-smart/low-carbon cities initiative, promoting trade in green goods, and demonstrating clean energy projects and products. We will also be advancing major carbon capture, use, and storage demonstrations to deal with emissions already in the atmosphere. One potential project would secure carbon in an underground geologic reservoir. Finally, this agreement bodes very well for successful international negotiations at COP21. A main domestic argument in the United States against multilateral climate action has been China’s disinterest—this joint agreement knocks the feet out from under that criticism. Additionally, at previous talks—especially in Copenhagen in 2009—the rest of the world has looked to the U.S. and China for leadership, and has used our reluctance as an excuse not to act. Now, the U.S. and China, especially as we continue to drill down into the practicality of meeting these targets at home, have the opportunity to lead on effective domestic policy in conjunction with other countries. But the agreement is also problematic. China’s promise makes no specific mentions of pollution targets, nor states how quickly they will begin lowering their emissions after 2030 (or even, frankly, if they will lower them at all. The agreement also leaves room to remain indefinitely at 2030 levels). Some observers also think that China would have reached these levels anyway, due to their ongoing efforts to cut smog and other air pollution. China is aiming to meet its goals by using unconventional renewables like large hydroelectric and nuclear—which many environmentalists see as better than fossil fuels for their carbon emissions, but that have other problems including community displacement, flooding, and habitat change in the case of hydroelectric and waste disposal issues in the case of nuclear. And since and increasing natural gas usage here at home would have gotten the U.S. to these numbers eventually, our targets could potentially have been even more stringent. Additionally, since the agreement on the U.S. lasts until at least 2025, it is possible that Obama’s successor could choose to undo the agreement through executive action. Stay tuned for the second post in this series, which will delve into the domestic implications of the U.S./China agreement, as well as the role Connecticut could play in helping the U.S. meet our promised targets. Posted by Sarah Ganong, Media Coordinator at CFE/Save the Sound. What are your thoughts on the shift in language from China about peak emissions, instead of their historic rhetoric of keeping track of intensity levels? I don’t think this announcement signals a huge shift in China’s approach. They promised at the recent UN Climate Summit in NYC that they would soon offer a peak emissions date–what was promised in this deal with the U.S. The Climate Summit announcement, however, still had a major emphasis on intensity levels.